Question: I have seen threads that talk about polygon/triangle counts needing to be somewhere around 600-800 (I think), but then I see some current ships like Mandomans' Comet. It's a great looking ship, but I don't even want to know the polycount on it! }:] (ok, ya I do, I am curious!) And I understand the higher the count, the slower the game is gonna run etc.. I have been trying to keep my ships as low as possible and have had no troubles so far on my wheezing little laptop. But then again, all my ships have been set as player only, so I am not likely to run into bunches of them. What is the current "goal" (?) for poly/triangle counts on a single ship model now? 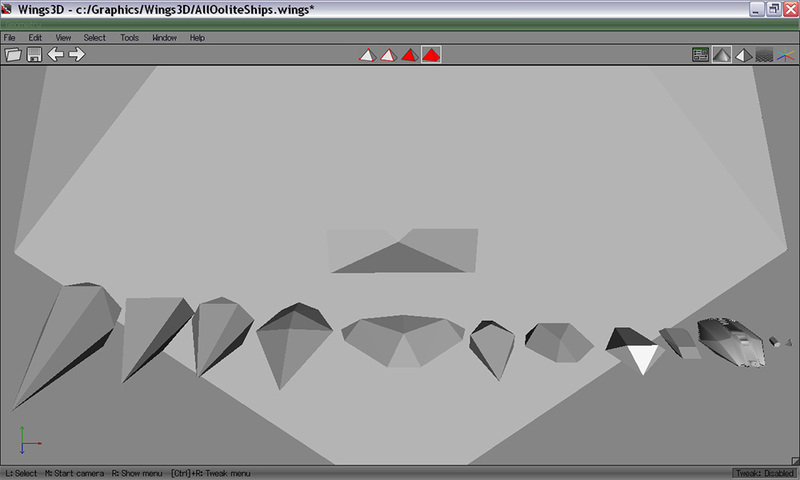 I thought I could make this available as a Wings3d file, or just as a single solid .obj file for people to bring into their modeling program to help give them an idea for scaling their ships. Problem: I couldn't convert the Asp (I tried both python scripts, but it just gave an error...) so for the picture, I had to use Griffs Asp. If someone has one already converted, I will add that in instead of Griffs, so that this could then be distributed. Oh, and the next picture explains why I couldn't get that 1500 meter leviathan out of the dock! LMAO! Paradox wrote: Question: I have seen threads that talk about polygon/triangle counts needing to be somewhere around 600-800 (I think), but then I see some current ships like Mandomans' Comet. It's a great looking ship, but I don't even want to know the polycount on it! }:] (ok, ya I do, I am curious!) And I understand the higher the count, the slower the game is gonna run etc.. I have been trying to keep my ships as low as possible and have had no troubles so far on my wheezing little laptop. But then again, all my ships have been set as player only, so I am not likely to run into bunches of them. What is the current "goal" (?) for poly/triangle counts on a single ship model now? Older versions of the game had a poly-limit, but that was "fixed" (lifted) a couple of versions back. Now you can have as many as you want, although as you already noted the higher the poly count the more lower-end machines (and/or ones with Intel chips seemingly) will struggle to do the work with a decent poly-count. But there is no real goal, other than making the ships look good, or more accurately look how you want them to. See here for the latest discussion about the Anaconda. The Anaconda isn't actually far off, ridiculous as it seems. A barrel has a volume of ~300 cubic metres. The Anaconda has a volume of ... approximating it as a cone ... ~210,000 cubic metres. So you could fit about 700 inside if you didn't need anything else. The scales might be arbitrary, but they're not too far off in this case. As for polygon counts, the planet has 20,000 (or 8,000 at reduced detail) if you're up close to it, so you'll probably be okay with your ships. cim wrote: The Anaconda isn't actually far off, ridiculous as it seems. A barrel has a volume of ~300 cubic metres. The Anaconda has a volume of ... approximating it as a cone ... ~210,000 cubic metres. So you could fit about 700 inside if you didn't need anything else. The scales might be arbitrary, but they're not too far off in this case. 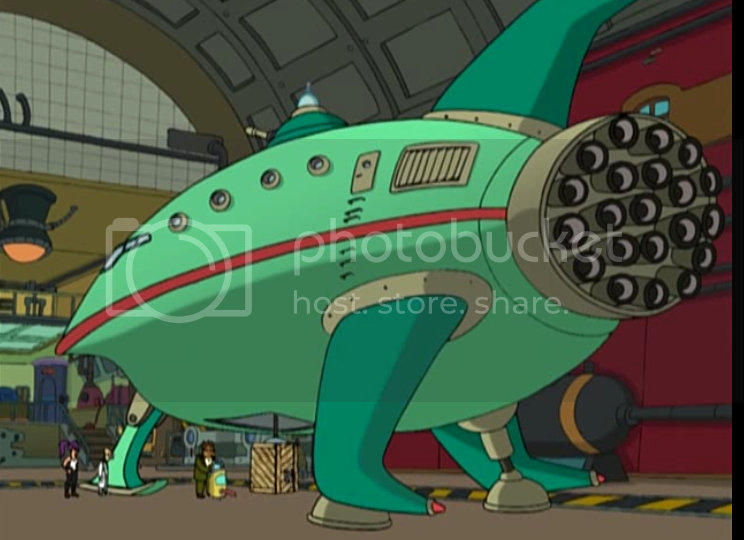 Last time you approximated you came closer to 500, and Captain Beatnik came up with a visual representation of an Anaconda and 750 barrels, showing clearly that there would be no space at all left for things like life support or engines. A fully stuffed Anaconda would be rather more like a non self-propelled [wp]barge[/wp]. Commander McLane wrote: Last time you approximated you came closer to 500, and Captain Beatnik came up with a visual representation of an Anaconda and 750 barrels, showing clearly that there would be no space at all left for things like life support or engines. A fully stuffed Anaconda would be rather more like a non self-propelled [wp]barge[/wp]. Thargoid wrote: Older versions of the game had a poly-limit, but that was "fixed" (lifted) a couple of versions back. OK, thank you, I don't feel nearly so guilty now. };] Time to go back and "smooth" a few things. Commander McLane wrote: See here for the latest discussion about the Anaconda. Lol. Roger that Commander, glad to see it's being addressed! };] Thank you for the link! cim wrote: As for polygon counts, the planet has 20,000 (or 8,000 at reduced detail) if you're up close to it, so you'll probably be okay with your ships. Hello, I don't normally post here, but thought this might be the appropriate place. I'm going on;;;;;;;a sabbatical. I'm tired of building ships that I can't make do what I intended, so i'm laying off for a while. If any of you are interested, and I certainly understand if you're NOT interested, here are the oxps I was working on, uploaded in zip form to Box. Some are nearly complete oxps, while others, like the MandoTechFleet, the Comet, the MT1005Flathead, and the Gyro are not complete, simply because I don't know how to make them behave the way I want. Some are even just Blender files. Someone downloaded all of them, so I figured one person is all it takes. Last edited by mandoman on Mon Mar 11, 2013 2:09 am, edited 1 time in total. Mandoman, I'm sure I'm not the only one who will miss you and both your ships and your input here. May your sabbatical be enjoyable for you, and short for the rest of us. Hope to see you back before too long. Enjoy your break, Mandoman.. who knows, maybe you'll even find some time to just play the game..
Hehehe.. shouldn't that be.. 21 engine exhausts?